Tomorrow there is a panel discussion about media including alternative facts, counter narratives, and false flags in conjunction with the show, False Flag: The Space Between Paranoia and Reason at Franklin Street Works. Moderated by New Haven artist and Franklin Street Works guest curator Jeff Ostergren, the panel includes artist Alexandra Bell, scholar Jack Bratich, and journalist Alexandria Neason. In advance of this programming, I am reposting my article from the Art21 magazine about artist Alexandra Bell and her Counternarratives series. Alexandra Bell, Counternarratives. Presented at MoMA PS1 as part of VW Sunday Sessions, 2017. Image courtesy MoMA PS1. Photo by Charles Roussel. NOV / DEC 2017 ISSUE "Empathy"
Since January 2017, Alexandra Bell’s large prints have been spotted around the Bed-Stuy, Crown Heights, and Bushwick neighborhoods of Brooklyn, New York. Many of these public works were installed by the artist without permission; others, such as the recent exhibition in the courtyard at MoMA PS1 and on the campus of Bennington College in Vermont, were arranged and planned with Bell. 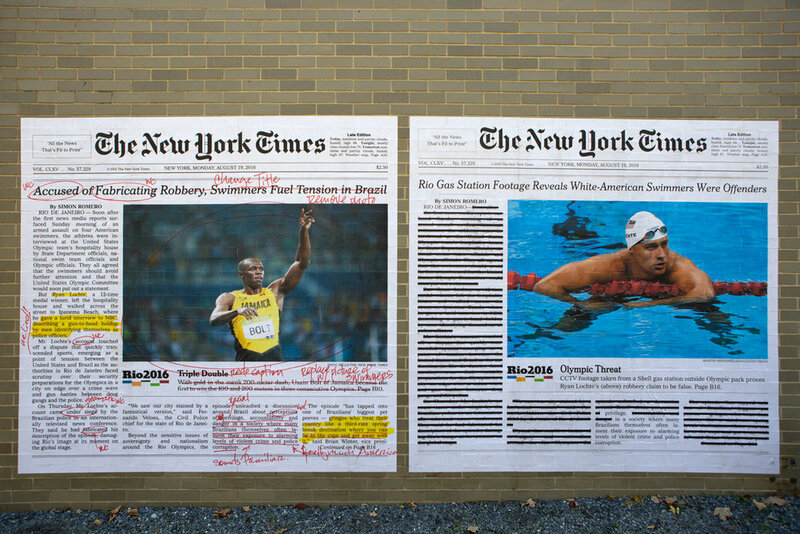 The Counternarratives series shows Bell’s inscribed corrections of New York Times print articles, exposing editorial bias conveyed by ill-chosen images, poorly worded headlines, and textual masking of white crime. Her works reveal viewpoints that abrade the dominant narratives about power and race portrayed by the media. The first work in Bell’s Counternarratives series was posted on the night of New Year’s Eve 2016. Bell’s notes and redactions to the New York Times article about the death of Michael Brown appeared on one side, and her revised article was shown on the other. 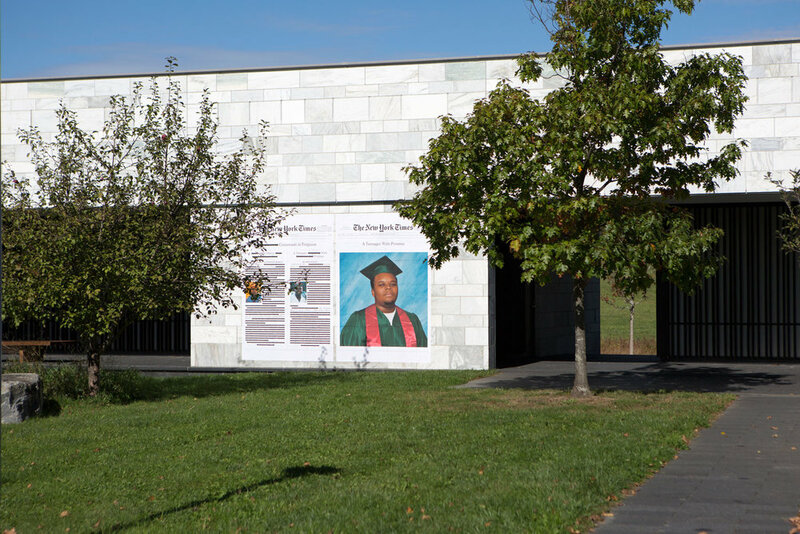 Bell’s version showed a full-width graduation photo of Michael Brown, as opposed to the more casual photo selected by the Times editors, which split the page with—and followed after—a profile of the police officer responsible for his death. 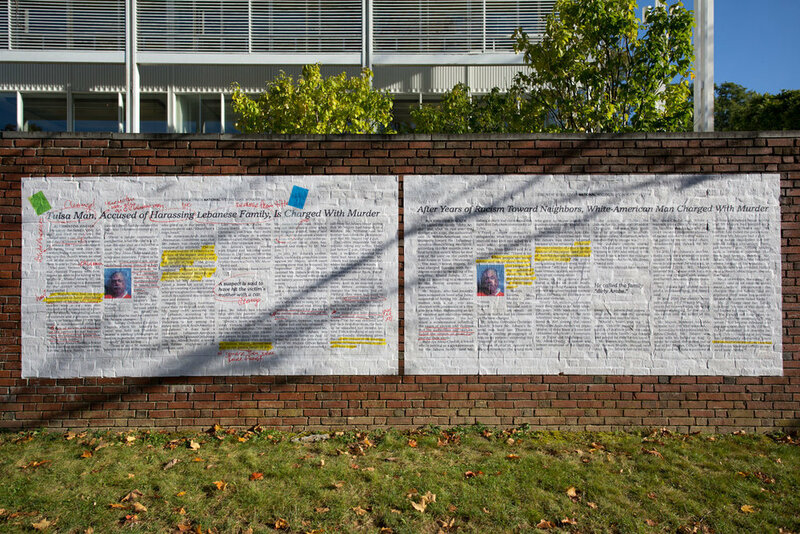 The two posters—one printed and the other propositional—outline the limited and biased perspective of the newspaper on the troubling death of an unarmed black teenager, fatally wounded by Darren Wilson, a white police officer. Alexandra Bell. Olympic Threat, 2017. Installation view, Buildings and Grounds, Bennington College. Photo by Keegan Ead. Courtesy of Usdan Gallery at Bennington College. Then in May, Bell revised and pasted a new version of the prints around Brooklyn. Bell said she wanted the work to be on display for the occasion of Michael Brown’s birthday. Over two years had passed since the shooting in Ferguson, Missouri, but the message of Bell’s revised headline, “A Teenager with Promise,” was still pressing. Race, especially how it is portrayed in the print version of the New York Times, is also the crux of the four other works in the Counternarratives series. The second installment reworks a front-page article about Ryan Lochte, a swimmer from the United States competing in the 2016 Olympics in Rio de Janeiro, and his suspicious claim of a late night robbery. The New York Times version of the article was accompanied by an unrelated image of the Jamaican sprinter, Usain Bolt, and the headline implicitly gave Lochte the benefit of the doubt. The Times wrote the swimmers were “accused of fabricating robbery,” as opposed to Bell’s more direct rewrite: “Rio Gas Station Footage Reveals White-American Swimmers Were Offenders.” Next, Bell was motivated by xenophobic language in an article about a hate crime in Tulsa, Oklahoma. The contrasting size and placement of two feature articles on tennis players—retired player John McEnroe and Venus Williams, who holds five Olympic medals in the sport—became the subject of the fourth work. The final and most recent work in the series analyzes the white supremacist rally with torches in Charlottesville, Virginia. Alexandra Bell. Tulsa Hate Crime, 2017. Installation view, Crossett Library, Bennington College. Photo by Keegan Ead. Courtesy of Usdan Gallery at Bennington College. An important shift of focus unites the Counternarratives series. Reproduced to the scale of the human body, the weight and presence of the enlarged texts and images appear more urgent. The act of reading a newspaper becomes collective when placed in public spaces. Gathered on the sidewalk, a group of people can read Bell’s work together. This communal experience replaces the often singular and private reading of a newspaper, either digitally or in print. The Counternarratives series asks readers to consider how often we read as members of communities or as empathetic citizens. And how do we respond to detected injustices within the media? Bell’s thoughtful analysis of the New York Times underscores the importance of examining and improving the veracity and fairness of news publications in our turbulent political divide. Her critical position offers an antidote to a ubiquitous and dismissive attitude toward the media through her painstaking revisions. Bell, who holds a Master’s degree from the School of Journalism at Columbia University, evinces her dedication to the field by reading and revising the news with abstemious care. Alexandra Bell. Venus Williams, 2017. Installation view, DownCaf, Bennington College. Photo by Keegan Ead. Courtesy of Usdan Gallery at Bennington College. At the same time, Bell understands that the field of journalism has a substantial and troubled history. She said, “I think the bias that haunts most publications is subtle and is not new.”1 She works with relatively recent articles, but with Bell’s encouragement, viewers can forge connections to the problematic content of the past. Viewers have begun to follow Bell’s example and are no longer mindlessly ingesting the news—instead they are considering the bias implicit in the space allowed and words chosen to describe events. Bell believes that another poignant way the field of journalism can combat these biases is to diversify their editorial staff. Writing comes with responsibility and privilege. The editorial staff should include greater numbers of marginalized groups. The New York Times—and all news publications—share a responsibility to represent the minority perspective, even if the editors are outside that sector of the population. Bell’s Counternarratives series illustrates how publications can prune the printed word more cautiously, yet more drastic changes are warranted that precede the drafting and editing phase—changes that speak to the priorities of the newsroom. Alexandra Bell. A Teenager With Promise, 2017. Installation view, Center for the Advancement of Public Action, Bennington College. Photo by Keegan Ead. Courtesy of Usdan Gallery at Bennington College. Bell said, “There are moments when the journalism field looks at itself and makes some changes.” The popularity of Bell’s works across social media and the anonymous postings of her works in Chicago and Washington, D.C. demonstrate Bell’s prescience of that moment, yet the media appears reluctant to change. Earlier this month, Bell was profiled in the New York Times, the source of the biased content for all of the works in the Counternarratives series. The article did not concede any editorial error. The text above was originally published in the Art21 magazine. The show continues through January 6, 2019 at Franklin Street Works.